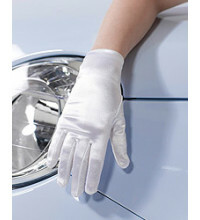 Jupon provide a range of bridal gloves for children, we stock mat, satin, netted and fingerless gloves in both ivory and white colours. Beautiful Kids Net glove, fits ages 4 to 7. All kids gloves have a matching adult glove available for that perfect match. Available in White and Ivory. ..
Beautiful Kids Net glove, fits ages 8 to 12. All kids gloves have a matching adult glove available for that perfect match. Available in White and Ivory. ..